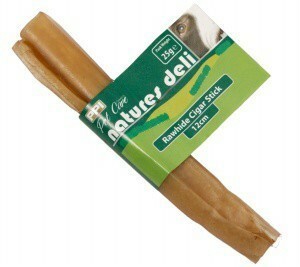 PPI Pet Care Essentials - Natures Deli Rawhide Cigar Sticks 12cm. A complementary pet food for dogs. Feeding guide: Feed as a treat or reward anytime as part of a balanced diet. Ensure fresh water is always available for your pet. Chews should always be gievn on a non-stainable surface and feeding should be supervised. Composition: Cattle Hide. Analytical Constituents: Crude Protein Min. 70% - Crude Oils / Fats Min. 1% - Crude Ash Max. 3% - Moisture Max. 18% - Crude Fibres Max. 1%. Store in cool dry place.